Why do you lead worship? Often the motives are mixed. You find yourself wanting to point people to Jesus but also feeling a desire to be noticed and praised, to make yourself the center of attention. Stephen Miller is the worship pastor for a large church of young, energetic Christians. He and his band record albums and lead worship for conferences all over the country. He knows the temptation to make himself the show, to pursue fame, to seek the applause of other people. And he has learned to want nothing to do with it. In this book, Miller exhorts his fellow worship leaders to make Jesus the center of all their efforts. He teaches how to do this with Scripture, teaching, prayer, story, and song. In all, Miller's call for worship leaders is to lead worship, whole-hearted and whole-minded exalting of God, rather than making a spectacle out of it. 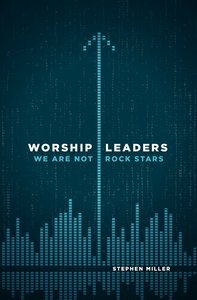 About "Worship Leaders, We Are Not Rock Stars"